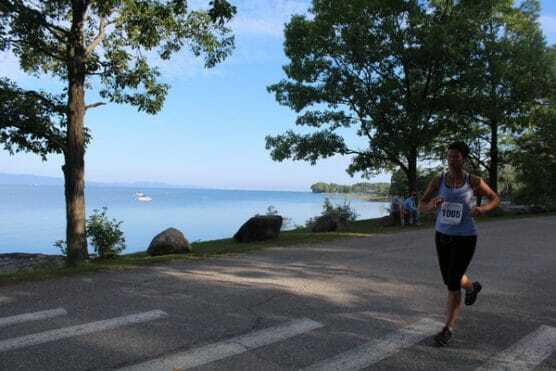 Surrounded by the rolling green Adirondack Mountains and the deep blue waters of Lake Champlain, the small Vermont town of Shelburne, population just over 7,000, plays host in mid-September to this half, which takes runners on an out-and-back race that starts and finishes at Shelburne Beach. From there, the race unfolds along a largely north-south route, heading south along Beach Road, Bostwick Road, Orchard Road and Lake Road, all the way south down to the half-way turnaround point near Thompson’s Point Road. Once there, the course then returns north along the route runners just covered, all the way back to Shelburne Beach for the race finish. Gorgeous rural scenery. 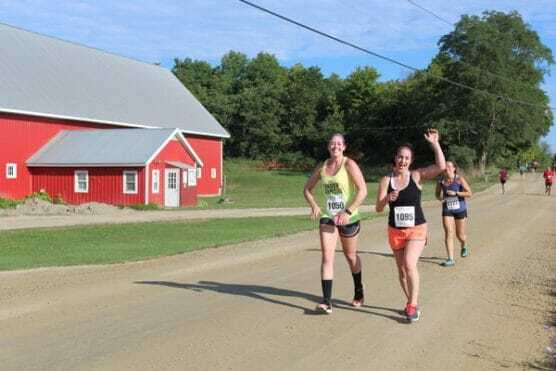 Along the way, runners get to see the peaceful, bucolic scenery of this part of western Vermont, with wide-open farm fields specked with rolled hay bales, and the occasional tree-lined stretch of road. There’s a brief stretch along the shoreline of the lake near Holmes Creek, and there are plentiful farm fields and farmhouses all along the route. Historic sites. 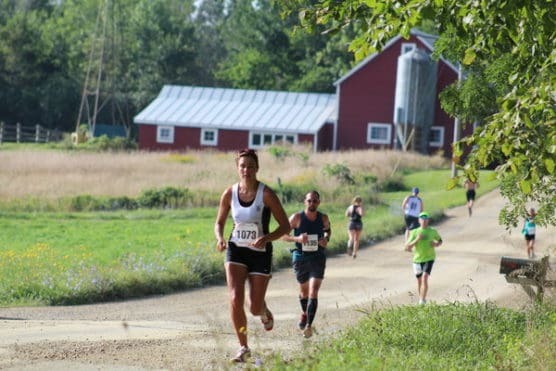 While they’re in town, runners can check out Shelburne Farms, a 1,400-acre working farm and National Historic Landmark that’s devoted to sustainable farming and cultivating environmentally-friendly farming practices. You’ll also get to see the Shelburne Museum and the Vermont Teddy Bear Company, where you can take a tour of the factory where these world-famous toys are made. Registration will be limited to the first 500 entrants, and the terrain is a mixture of paved and dirt roads. Nestled along the shoreline of Lake Champlain in northwestern Vermont, about 7 miles south of Burlington and roughly 40 miles northwest of Montpelier, Shelburne typically sees mild to moderately warm weather in September, which has brought record temperatures here as low as 25°F (in 1963) and as high as 98°F (in 2002). See the race route map for the Charlotte Covered Bridge Half Marathon here. 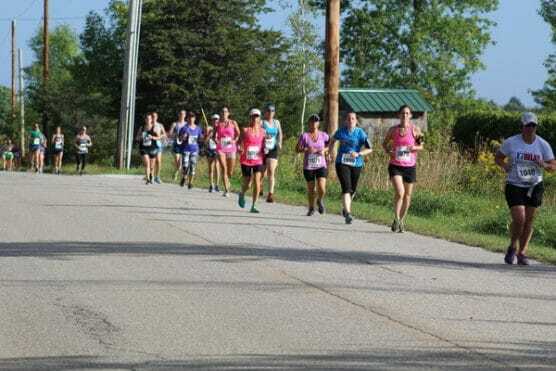 To reserve your spot in the 2019 running of Shelburne’s Charlotte Covered Bridge Half Marathon, 10K or 5K race, register online at the event website below. 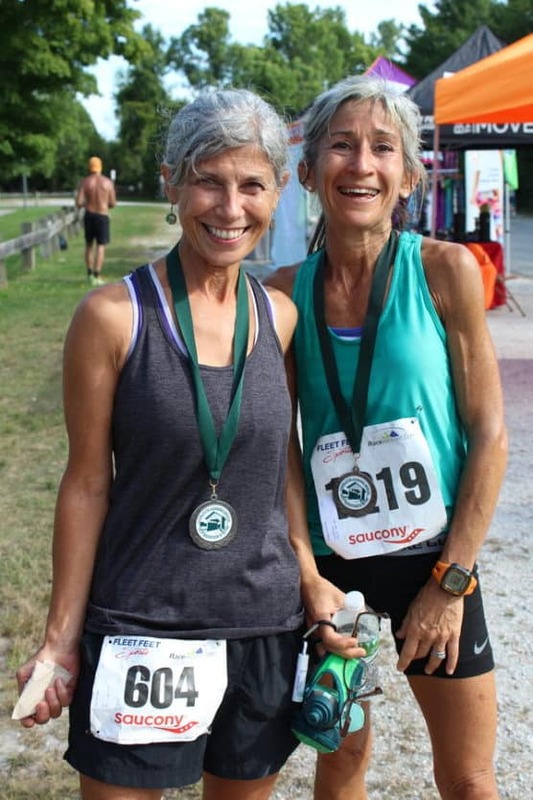 Ever run in the Charlotte Covered Bridge Half Marathon? Share your impressions here, or post your review in the Comments below. As a warning to out of towners, do NOT consider the “Heart of the Village Inn” in Shelburne for race lodging. It changed ownership in the past few years, and I had a nightmare experience dealing with them. The people who are running it are incredibly unprofessional and unethical. It’s the closest place to the starting line, but just stay away and go to a place that is a professionally run business.